Today marks a milestone for NPR, Member stations and our largest and most loyal mobile audience, with the much-anticipated launch of the NPR app (formerly the NPR News App) on the iOS platform. You can download the app or get the new update now: Tap or click here. This is the first significant overhaul of the app since it appeared in 2009. In the years since, the app's audience has grown to well over 1 million monthly users on iOS alone, and it has consistently won high ratings in the App Store. While designed to meet the needs of that longtime loyal audience, this version reflects new best practices in design and user experience, while also offering more a deeply engaging experience that embraces the range of NPR's and Member stations' programming. The launch caps an intense, 18-month collaborative effort among NPR's Digital Media, News and Programming teams as well as an advisory group of leaders from 31 Member stations along with 3,400 beta testers, whose usage data and feedback informed the decisions about changes and improvements. While, like its predecessor, the NPR app provides an up-to-date digest of the news of the hour, with headlines and breaking alerts, you'll also find more content from the wider world of public radio: enterprise reporting, science, entertainment, music, storytelling and cultural programing, live streams from Member stations, and the most popular nationally and locally-produced podcasts. Updated design: The app has a completely new look, built around ease of use, intuitive navigation, readability and appealing visuals. Enhanced reading experience: Users can quickly scan the headlines, dive into stories of interest, and explore a range of 25 different subjects through new topical navigation. They can also receive push alerts and breaking news notifications. 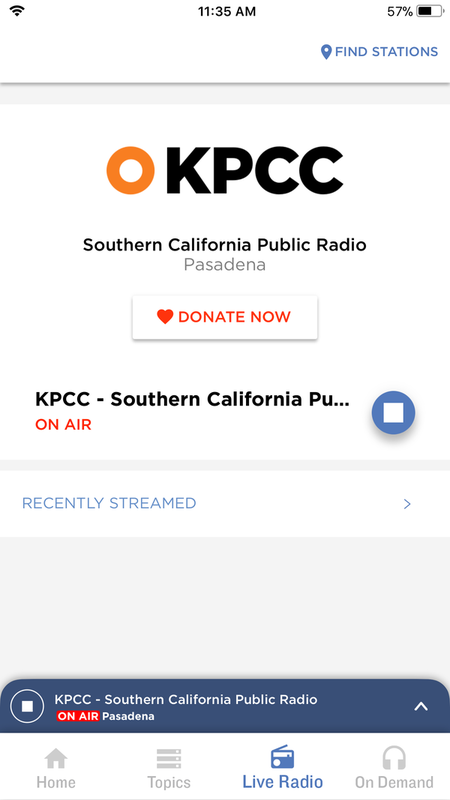 Improved Member station presence: Through a localization algorithm, users can easily identify their primary Member station and then access their local live stream, headlines, stories and podcasts, as well as make a donation. On-demand audio: The four most recent episodes of nearly 30 NPR podcasts will be available through the app, plus podcasts produced by Member stations. Listeners who wish to dig deeper into the archives of their favorite programs will find them on NPR One or their favorite podcast app. 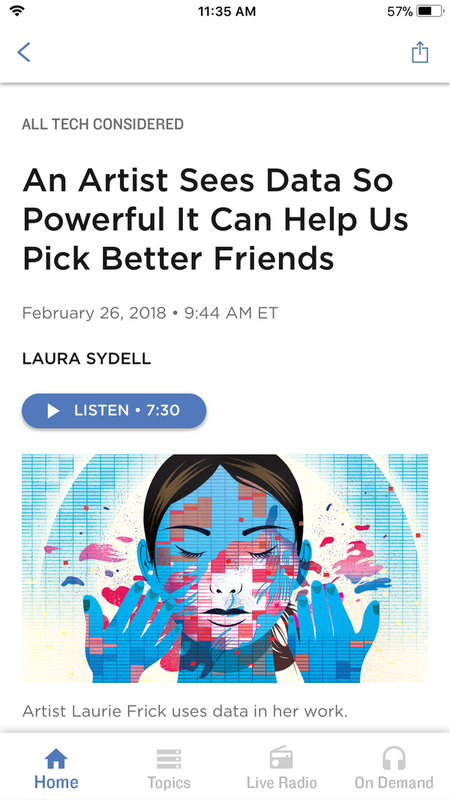 The new NPR app is a close complement to NPR One, an audio-centric experience designed for personalized discovery of national and locally-produced news, stories and podcasts. 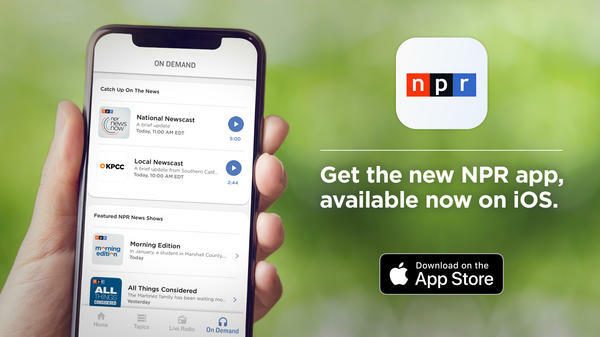 Like the NPR app, NPR One continues to evolve and grow, now expanding its reach beyond the smartphone to smart speakers and other new connected devices. Today's launch is just a beginning. Among other improvements, over the coming months we plan to integrate more locally produced content and other premium features. We will also take everything we've learned and rebuild the app for the Android platform. Until then, Android users can continue to use their existing NPR News app. Start reading and listening today. NPR is always on.